Maybe you should take the time to make a good model instead of making 1 low poly, un-impresive one every other day. At least this looks like a truck...but instead of trying to impress us with 100000000000000000000000000000 rubbish models, work on one and detail it. 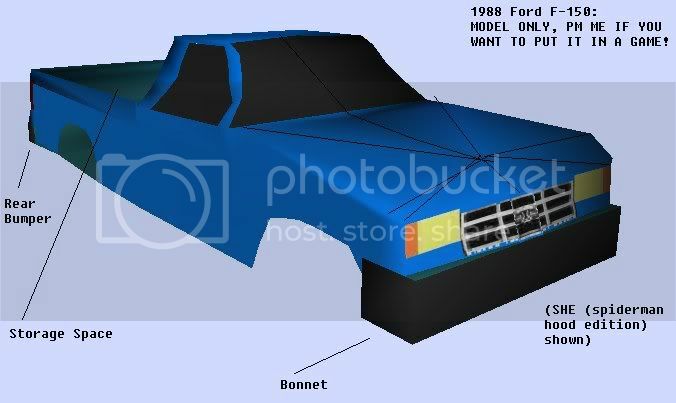 edit - your models seem to look kinda crumpled, because the pillars and hood are all bumpy... did the Jetta and F-150 collide at some point? hey i dont think it is that bad, heck you guys should have seen mine(sucked so bad i moved to making maps).lol......still not good at that!!!!!!! so keep practicing, and posting!!!!!! Ok look..I cant model for s*** ...ive done like 2 or 3 models tops...but look..
My model looks good. crazy_e, if you think that's good...well think again. not trying to be harsh obviously, but my point is...work on one car and learn rather than trying to impress us with a lot. By all means, look at some of the projects here in PYP - like Riva's or someone's. Look at their wireframes, look at their progress, and model in that same vein. Your models have the basic idea, which is great, but you need more polies, better placement, better extraction, better normals, more detail, better textures...but otherwise it's great. I agree with the others. Work on 1 model only would be best. and you can get better at it. and try to make yours look as accurate as you can. About to say the same thing.. That model is awful, even for a first one. I mean, look at the state of it, the hideous thing.